The United States suffered one of its darkest days on Sept. 11, 2001, when 19 members of an Islamic terrorist group called al-Qaida hijacked four commercial planes. The hijacked planes were then used as weapons by crashing them into buildings with unsuspecting people inside. Two of the planes were used to strike the Twin Towers at the World Trade Center in NYC, while another was used against the Pentagon in Virginia. A final plane crashed in Pennsylvania after several brave passengers made an effort to take control of the plane from the hijackers. There has been speculation about where the final plane was headed, but the location has never been confirmed. Four separate planes were hijacked leaving from three different airports. Two flights were from Boston, one from Washington, D.C., and one from Newark, New Jersey. The two flights from Boston were the first to reach their targets. American Airlines Flight 11 struck the North Tower of the World Trade Center at 8:46 a.m. Many people thought this first crash was a tragic accident; no one could imagine what was still to come. Seventeen minutes later, at 9:03 a.m., the second Boston flight, United Airlines Flight 175, struck the South Tower. It was becoming clear that this was no accident. The United States was being attacked. At 9:37 a.m., the third plane reached its target. American Airlines Flight 77 from Washington, D.C., struck the western side of the Pentagon in Arlington, Virginia. The fourth flight, United Airlines Flight 93 from Newark, New Jersey, never reached its intended target. Passengers on board had been told about the other attacks, and they soon realized their plane was also a part of the terrorists' plan. Following a vote, the passengers decided to attempt to take the plane back from the hijackers. After a six-minute fight for control of the plane, Flight 93 crashed into a field near Shanksville, Pennsylvania. Following the two plane collisions, the Twin Towers of the World Trade Center burned. While rescue workers and others worked to remove people from the buildings, the super-hot flames, fed by the airplane fuel, damaged the steel structures keeping the towers standing. All four planes were originally on trips cross-country, and they were chosen because they would have the most fuel on board. 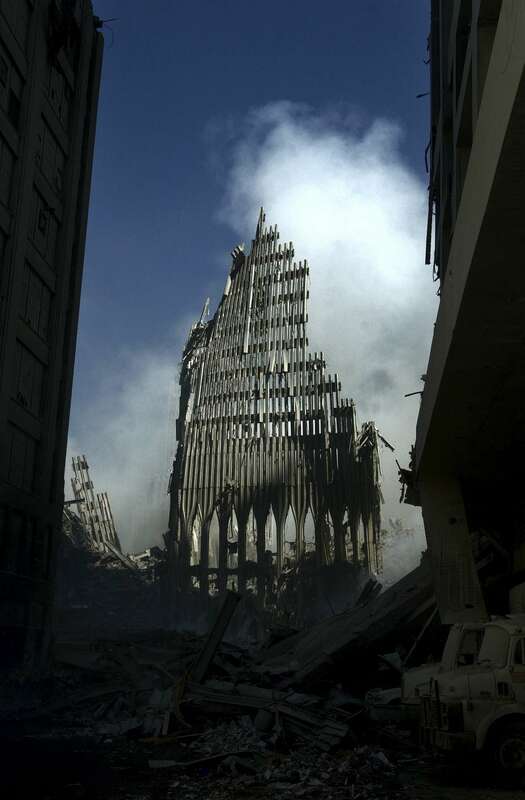 At 9:59 a.m., 56 minutes after it was struck, the South Tower collapsed. Twenty-nine minutes later, at 10:28 a.m., the North Tower also collapsed. Almost 3,000 people lost their lives as a result of the terrorist attacks on Sept. 11, 2001. All 265 people on the four flights were killed, including the 19 hijackers. In and around the World Trade Center, 2,606 people were killed. The Pentagon attack killed another 125 people. In the face of extreme danger, many brave men and women gave their lives to save others. Firefighters, police officers, and other first-responders rushed into the buildings to try to help people escape, and everyday people, office workers in the Twin Towers, also worked to help their coworkers get out. Of the emergency personnel, 343 NYC firefighters were killed, along with 72 police officers and 55 members of the military. Their sacrifices helped save countless lives that day. The passengers aboard United Airlines Flight 93 chose to fight back against the hijackers, knowing they would probably not make it off the plane alive. It will never be known how many innocent people they saved through their act of heroism. Following the attacks, President George W. Bush started what would be called the War on Terror, which involved retaliatory attacks on the Taliban in Afghanistan, who had sheltered Osama bin Laden. For several years, bin Laden, the leader of al-Qaida, was the United States' number one target. In 2011, after a search lasting nearly 10 years, bin Laden was finally found and killed by U.S. Navy forces in Pakistan. The people of New York City suffered through the dust and debris at Ground Zero, the name given to the World Trade Center attack site. Rescue workers and construction crews suffered lingering health effects from clearing the materials that had been used in constructing the buildings in the 1970s. Today, there are memorial sites for each of the locations where people lost their lives that day. The 9/11 Memorial and Museum is located in and around the space formerly occupied by the Twin Towers. The National 9/11 Pentagon Memorial in Virginia is located near where Flight 77 struck the building, and the Flight 93 National Memorial is located at the site where Flight 93 crashed. 11 Facts About 9/11: Learn the basics about the 9/11 attacks on this page. What Happened on 9/11? It can be hard to understand what happened on Sept. 11, 2001, but this guide can help sort it out. 9/11 Facts: Find an explanation of the 9/11 attacks as well as worksheets teachers can download on this page. Sept. 11 Fast Facts: CNN has a quick rundown of the facts about 9/11 here. Sept. 11 Attacks: For people alive at the time, 9/11 is part of their memory, but for those who weren't alive then, an encyclopedia can be a good place to learn more. Remembering 9/11, 17 Years Later: This page looks back at what happened and remembers the victims. 9/11 Terror Attacks: Find some quick facts about the people, places, and events involved in the 9/11 attacks. 9/11 Timeline: The History Channel has a timeline of Sept. 11, 2001, showing what happened that morning. Seven Incredible Stories of Heroism on 9/11: During and after the attacks, many people, both first-responders and regular citizens, were heroes. The 9/11 Terrorist Attacks: This page from the BBC gives background on the attacks as well as explaining what happened. Sept. 11, 2001, Facts: Find facts and figures about the 9/11 attacks here. What Was 9/11? : This article does a good job of explaining what happened during and after the 9/11 attacks. What Was it Like? Answers to Children's Questions About 9/11: It can be hard to imagine what it was like to be in New York City on Sept. 11, 2001. One woman, who was 12 years old when the attacks happened, wrote a book about her experiences, and she answers some questions she's gotten from kids on this page. What it Was Like to Watch the 9/11 Attacks From Your Classroom Window: A lot of people tried to put their feelings and experiences into words after 9/11. One result was a book, a series of monologues about what that day was like for students. An excerpt is on this page. 9/11 FAQ: The 9/11 Memorial & Museum has a good page here that answers questions about the attacks.